Do you face these challenges? 1. My child can't seem to BREAKTHROUGH in his exam results no matter how hard he studies! 2. There is just too much information to memorise in the textbook. 3. My child is easily distracted and finds learning a chore! 4. I just don't know how to inspire my child for success in life. 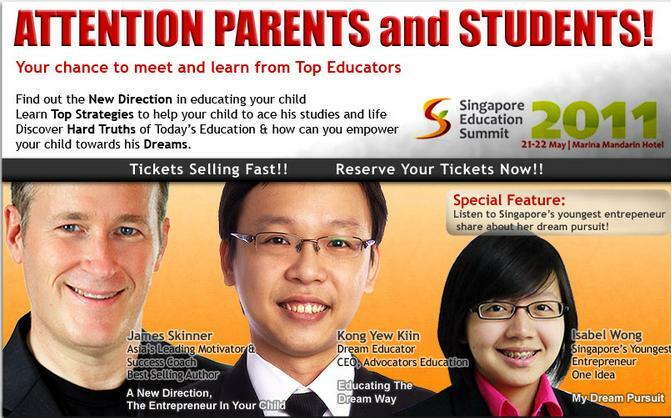 Proudly brought to you by EdustarAsia in collaboration with EduValue, Singapore Education Summit 2011, an unprecedented event that seeks to empower all parents and students for success in academics and life will address all these issues and more! With only limited seats left, tickets are selling out fast. Wait no more and sign up now!